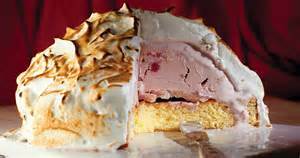 I haven't had baked Alaska for a few years now, not since my ex wife cooked it. However, I know it's a superb dessert of meringue covered ice cream on a bed of sponge and fruits, cooked in the oven for a few minutes to firm up the meringue. As a child, I was always enthralled as to why the ice cream in the hot oven never melted under its protective coating. It saddens me then to hear that this wonderful dessert faces extinction. It was once at the heart of every cook's repertoire and would guarantee delight and amazement at any dinner party. It seems that many classic dishes are these days off the menu - pavlova (we have a home-made one in our freezer), beef wellington and baked Alaska may disappear for good, according to a recent survey. Maybe I'm just lucky to now be married to a BBC MasterChef finalists, who regularly delivers a classic dish for a dinner party or family gathering. In fact, I can remember when we last had Beef Wellington - Saturday 27th August this year! 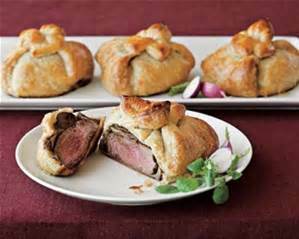 We favour individual 'mini' Beef Wellington - individual slabs of best fillet beef coated in crisp pastry. Being individual, you can cook the beef to the individual guest's preference (below). With one large Wellington, the fillet ends are always well done while the middle can be too rare. According to this survey, carried out by the Coop, the dishes perfected by such old time celebrity cooks like Delia Smith and Keith Floyd are going the same way as the largely forgotten pottage or Shropshire fidget pie. And it is all to do with many families saying that they don't have time to cook from scratch. I say, 'rubbish' - make time! But no, despite there being no shortage of inspiration from the likes of Jamie Oliver and Nigella Lawson, and the packed TV schedule of cooking programmes, younger home cooks prefer meals they can knock up quickly. This only confirms what I have thought for a while, chefs that grace our television airwaves do little to encourage their viewers to cook! The survey found that the UK's 'meal-makers' increasingly prefer ready-made sauces and meal kits. with spaghetti bolognese, chilli, lasagne and fajitas all popular. The research said that many traditional and local delicacies are in danger of extinction, as only one in ten of us pass down recipes to the next generation. The likes of Bosworth jumbles, Aberdeen rowie and Bath chaps, once treasured by the nation, are unknown to the majority of the population. Classics such as pavlova, tiramisu and black forest trifle are also on the verge of dying out, replaced by quicker, less complicated recipes. Other largely forgotten regional dishes include Yorkshire solomon gundy - made with herrings, brown Windsor soup, pottage and cured pigs' cheeks. 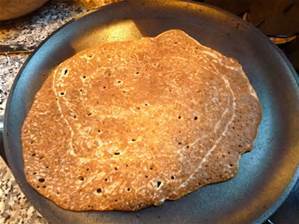 And when did you last have a Staffordshire oat cake (below) with your breakfast of bacon and eggs? I love them! Let's continue cooking the following dishes before they go the same way as the doo doo bird - baked Alaska, Black Forest trifle, Vol-au-vents, Swiss roll, beef wellington, tiramisu, duck a l'orange, summer pudding, meat loaf, pavlova and not to be forgotten, my favourite, faggots!